Although it is a latecomer to the AR-15 game, Ruger's AR-556 is a runaway success, giving the likes of the Smith & Wesson M&P-15 a run for their money. The days of running a modern sporting rifle or carbine without glass have been lost in the mists of time. Follow our guide later in this article to find the best scope for your Ruger AR-556. What is a Ruger AR-556 Used For? As an affordable, entry-level to mid-range modern sporting rifle, the Ruger AR-556 can be used for small to mid-sized game hunting, tactical ops, self-defense, three-gun competitions, target shooting, or almost anything else you can think of. The 556 NATO round and 16-inch barrel limit the effective range to somewhere around 450 yards, depending on various factors. The round is also usually discouraged as too small for use on deer or boar. Generally, you're going to be shooting varmints, paper, or fools at under 400 yards. The fact that reflex sights have been all the rage on AR-style carbines attests to this and this is what an M4-style rifle is really designed for. Everything from a fixed 3x power scope to a 1-4x or a 3-9x are great on a Ruger AR-556. The smaller your targets and the more open your shooting environment, the greater the magnification you need, but generally not much above 3-9x. How Accurate is a Ruger AR-556? The Ruger AR-556 has amazing accuracy. Despite its entry-level price, it can compete with ARs that cost twice as much. 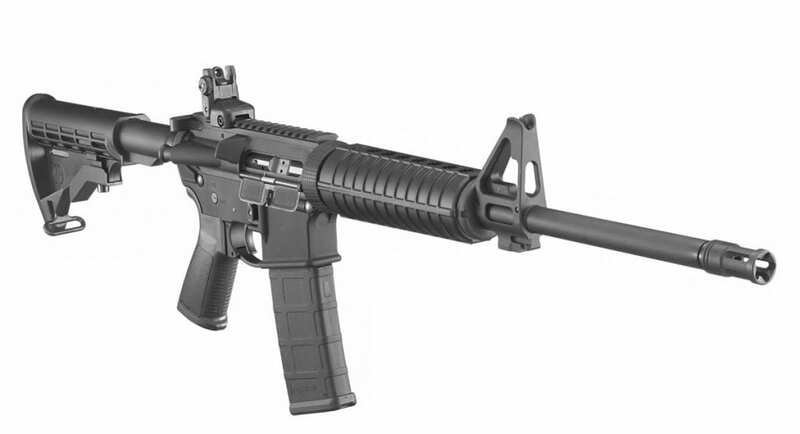 Ruger has not cut many corners to make the AR-556 as affordable as it is. Pretty much everything, notably the bolt carrier group, is designed to match military specifications. The most important component, the barrel, is cold hammer forged with precision rifling and a 1:8" twist rate. All these attributes, in addition to the lack of chrome plating, make the rifle as accurate as possible with most popular bullet weights. If anything detracts from the accuracy of the AR-556, it is the trigger, which is similarly unexceptional to the average military one. As long as you're shooting 35 to 77-grain bullets from a reputable manufacturer, you will be impressed, though success will vary with each particular gun and each make and brand of ammunition. 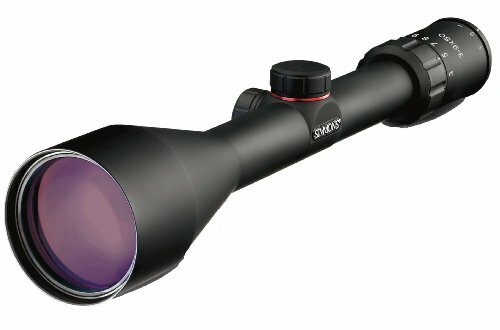 What Makes a Great 556 Scope? Generally speaking, a great AR-556 scope doesn't need excessive magnification or a huge optical lens. For most purposes, 9x or so is plenty, and weight is a greater concern than ultra-long-range accuracy. Much more important is quick target acquisition. Lower magnification scopes help with this, as do a long eye boxes and long eye relief. This means that the scope can be mounted further from the eye, but with a broad range in which you can effectively place your eye. As usual, build quality and robustness are key concerns in choosing the best scope. Rules of thumb are to look for a reputable manufacturer and pay about as much for a scope as you did for the rifle it will be mounted on. Key considerations to look for are a single-piece, hard coat anodized, gas purged, and high-grade aluminum tube and lenses which should at least be fully multi-coated and sealed with O-rings. Based on the considerations above, we have compiled a list of the scopes best-suited to the Ruger AR-556. Look no further than the models below to find the ideal scope for your setup. Bushnell is a classic American optics manufacturer based in Kansas. This scope is their, attempt to develop the optimum scope for the AR platform, and it does not disappoint. The 3-9x magnification range is perfect for getting the most out of the 5.56 NATO round's effective range without losing too much close-range field of view. The scope features a BDC ballistic reticle designed specifically for 5.56 NATO rounds loaded with bullets weighing from 55 to 62 grains. The reticle zeros at 100 yards and features aiming points out to 500 yards. Lenses are of course, fully multi-coated and O-ring sealed. The anodized aluminum tube is nitrogen purged to prevent fogging. The target turrets are beefy and adjust at a quarter MOA click value. 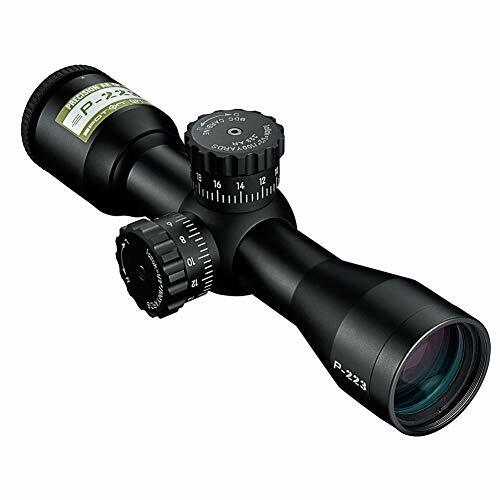 The scope features side parallax adjustment and a fast focus eyepiece. Eye relief is pretty standard, if a little short, at 3.5 inches. The erector cap assembly on the bottom of the control housing may stop you from using low scope rings, depending on the ring manufacturer. At 19 ounces, the scope is a bit on the heavy side, but hey, that means quality, right? It is also covered by a lifetime warranty. The magnification range and the BDC reticle are the top features, making this the best scope for your Ruger AR-556. Monstrum, of Laguna Hills California, has been around for about ten years. In that time, they have put out some great affordable products and this Tactical AO Riflescope is no exception. It features a reticle illuminated in either red or green with five brightness levels in each. The reticle is a rangefinder design. It resembles a BDC but the hash marks help you estimate the distance of a target. Parallax adjustment is located on the objective lens and magnification is adjusted on the eyepiece. Tactical-style windage and elevation turrets adjust a quarter MOA per click. They both lock and return to zero after sighting in. The aluminum body is nitrogen-charged and available in either black or flat earth. The scope is covered against defects in construction and materials by a one-year warranty. If you need something on a budget, this is a great option. Just remember, to a large extent, you get what you pay for. It can do an awesome job but isn't ideal for shooting much past about 350 yards. This is kind of the 'burner' of AR-556 scopes. Most shooters have great experiences with it, but it is not an ultra-long-range solution. The top features are the illuminated reticle and the locking turrets that return to zero. Vortex Optics of Wisconsin has been in operation since 2004. In that relatively short time, they have taken a huge bite out of the riflescope market, giving more established players a run for their money. The Crossfire II SFP is one of Vortex's more affordable scopes. 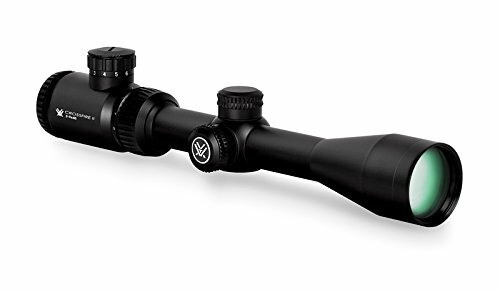 Like the two above, it goes for 3-9x magnification range that is ideal for mid- to long-range shooting with an AR-556. The center dot of the V-Brite reticle is illuminated for lighting situations that call for greater contrast. Located on the second focal plane, the reticle always maintains the same appearance. Vortex markets the scope as having long eye relief and a forgiving eye box, allowing you to gain a clear sight picture without having to hit the cheek weld just right. Not all shooters find this to be the case, however. Nevertheless, the fast focus eyepiece does give you convenient parallax correction. The windage and elevation turrets are capped for hunting, although the scope is considered dual-use between hunting and tactical applications. The turrets reset to zero after sighting in and adjust one MOA per click. The overall construction is everything you would hope for. The lenses are fully multi-coated and anti-reflective. The single-piece aluminum tube is nitrogen purged and O-ring sealed. The build quality is covered by Vortex's unconditional lifetime warranty one of the best ones in the business. This is another great, budget scope. The best features are the illuminated reticle and the warranty. Simmons had its start in 1983. 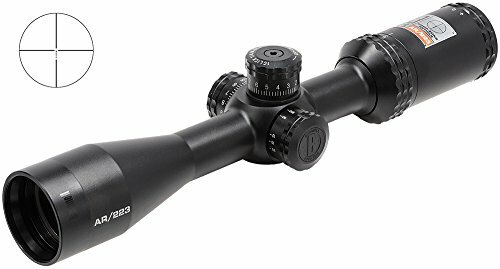 It is currently a subsidiary of Bushnell and a classic name in solid, affordable scopes. With this scope, we're sticking with the AR-556's ideal 3-9x magnification range, but this time with a perhaps needlessly-large 50mm objective lens stuck on the one-inch tube. Strangely, it isn't as bright as you expect from such a massive objective lens, but it is exceptionally clear. This aids in what Simmons dubs the scope's 'QTA', or quick target acquisition eyepiece. Eye relief is standard at about 3.75-95 inches. The reticle is a garden-variety duplex, simple but effective. Simmons labels their windage and elevation turrets both 'SureGrip' and 'Truezero'. They are pretty nice to work with for low-profile turrets. They lock and provide a quarter MOA adjustment per click. The construction of the scope ticks all the boxes, culminating in a recoil-proof, fog-proof, and waterproof design. The clarity of this scope is outstanding and definitely the top feature. It is a solid, basic, but effective choice in an AR-556 scope. The turrets and eyepiece are well designed. The objective lens will likely prevent you from using low rings, without adding as much brightness as it should. Nevertheless, this scope is a great option. Nikon is a world leader in every field in which optics are applied. They are no slouches in the riflescope market, often outperforming the competition and various price points. 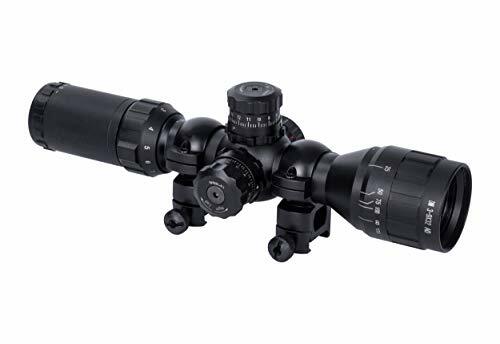 This model is unique among those on our list as a fixed 3x magnification scope. This gives you a happy compromise between the wildly popular reflex sights and your standard variable magnification scopes. You get a pretty wide sight picture and enough magnification to shoot at most practical ranges. Nikon's P-tactical BDC reticle is optimized for the 5.56 NATO/.223 round with a 55-grain bullet. The crosshair is set for 200 yards and the reticle includes hash marks for 400 and 600 yards, though both of these are over-optimistic. Parallax is hard-set for 100 yards, lenses are fully multi-coated, and the eye relief is generous. The one-inch tube is nitrogen-purged, O-ring sealed, and rated to be waterproof, fog-proof, and shockproof. One nice touch is the rubberized eye guard. The tactical-style windage and elevation turrets are big, knobby, and return to zero. Nikon offers lifetime repair or replacement of factory defects in build and material. Nikon is usually a very safe choice in a riflescope and this is no exception. If you need a scope for a brush gun or just want a bit of an upgrade from your current reflex sight, this is a great option. Optics can be one of the most confusing aspects of the firearms world. In reality, choosing a scope is not that complicated if you know what gun you will put it on and for what purpose. We're sure that you can find the best scope for your Ruger AR-556 on our list.